Lutheridge is a seminar and retreat center located in Arden, NC, near Asheville. Some outdoor amenities include: swimming pool, lake, playgrounds, basketball court, labyrinth, and walking trails. Limited wireless access is available, so please come prepared to unplug. We recommend you arrive between 3-5 PM on Tuesday, August 6, 2019. Registration opens at 3 PM, dinner is served at 6 PM, and the opening night events begin at 7:30 PM. Check out is at 11am on Sunday, August 11. Upon arrival, signs will lead you to the registration desk in the Faith Center, where you will receive a registration badge, a map of the camp, instructions on housing, work co-op assignment, a program book and schedule, details about the Youth Village, and other information to help you plan your week. Over 200 people will be attending ROOTS Week from throughout the South and across the country. Many of these folks will be driving, and we encourage attendees to carpool – it’s a great way to spend quality time with friends (or make new ones) and also helps to lessen the environmental impact of our collective travel. You can coordinate your carpools over on the ROOTS Rideshare Facebook group. If you’re using the Rideshare group please keep in mind: ROOTS is a village and so is this Facebook group! We envision this page, as a participatory and self organizing space. We can’t guarantee that every need will be filled, but we trust that our collective community will do our best to respond. If you plan to fly, Asheville Regional Airport is about 5 minutes from Lutheridge. However, it may be less expensive to fly into Greenville, SC (1 hour from Arden); Knoxville, TN (1.5 hours); Charlotte, NC (2.5 hours); Greensboro, NC (3 hours); Atlanta, GA (3.5 hours); or Raleigh-Durham (3.5 hours). If you fly in to Asheville Regional airport, note that ride-sharing services like Uber or Lyft DO NOT pick up from the airport. However, you can grab a taxi to get to Lutheridge. There is ample parking at Lutheridge. Once you have arrived at camp, you may find that you will not need to move your car for the rest of the week. 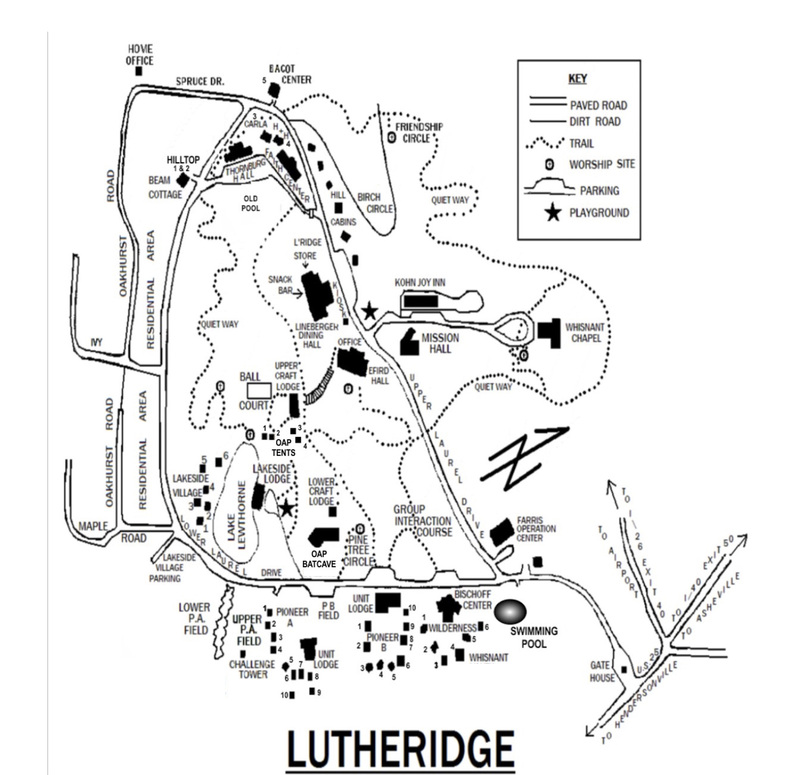 Lutheridge’s campus is also interwoven with many paved pathways and hiking trails. Consider bringing gear (bikes, hiking boots, running shoes, etc.) for alternative modes of transportation and recreation during ROOTS Week. We strive to make ROOTS Week an accessible environment and ask that you notify us of any accommodations you may need when you register. All communal gathering spaces at Lutheridge Conference Center are wheelchair accessible, but not all lodging is. If you require any type of accommodation – sign-language interpreter, wheelchair accessible housing, an alternative format for printed materials, golf cart transportation between buildings, etc. – please note this on the registration form and a staff member will follow up with you prior to ROOTS Week. Pack your summertime casual clothes, bathing suits, and a few special outfits or costumes for Late Night! You may also want to bring a small portable or window fan. Please bring your promotional materials for our Resource Area, and your one-of-a-kind creations to sell in our Arts Market! Bring art supplies/costume pieces to create in the moment, musical instruments for jam sessions, and additional tech equipment for site-specific work. And you’ll probably want to bring some extra cash in case you purchase items from the Arts Market, or contribute to Alternate ROOTS. And while you will be provided three meals a day, don’t forget to BYOS: Bring Your Own Snacks. The kitchen will only be available during mealtimes, and food preparation areas will only be accessible to kitchen staff. All items listed below are prohibited by the venue, so please don’t bring them to ROOTS Week. Anything else that would get not just you, but all of us, in trouble. ROOTS Week is a family-friendly environment, and we encourage you to bring your children! This is a rare and valuable chance for youth to meet, learn from, and create original art with artists from around the country. For children ages 5-13 we offer the ROOTS Week Youth Village where a licensed childcare provider will offer a variety of activities. For more on the Youth Village, click here. Children older than 13 are welcome to attend the general ROOTS Week programming including Learning Exchanges and performances. Parents and guardians of children bordering the age of 13 may decide to have their children participate in Youth Village or general ROOTS Week activities, whichever is most appropriate for your child. Babies and toddlers up to age 5 will be in the care of their parents or guardians. Please note: EVERYONE attending ROOTS Week – even babies and young children! – must be registered individually. Accommodations are limited, and to make sure attendees are as comfortable as possible, we need to have an accurate headcount of who will be staying on campus at Lutheridge. The Arts Market is back and better than ever this year! The ROOTS Week vendor space is an opportunity to offer your one-of-a-kind creations to the rest of our community! Table fee is $20 for a full table, and $10 for a half table. Tables, chairs, outlets and other basic set-up requirements are readily available. Those seeking space to offer FREE literature (i.e. organization materials and fliers) or free services are welcome to participate in the marketplace at no cost. Spaces are available on a first-come, first-served basis. Catch this opportunity while it lasts and share your super-charged crafts and talents with us all! For more information, email Aimee McCoy at aimee@alternateroots.org.